Director of Texas Children’s Trauma and Grief Center Dr. Julie Kaplow was recently named Chief of Psychology. Kaplow, who also serves as head of psychology in the Department of Pediatrics at Baylor College of Medicine, is an expert in childhood trauma and bereavement. As director of the Trauma and Grief Center, a SAMHSA-funded Treatment and Service Adaptation Center of the National Child Traumatic Stress Network, Kaplow oversees evidence-based assessment, treatment and research with youth and families exposed to traumas and/or losses, and develops and disseminates trauma- and bereavement-informed “best practices” to community providers nationwide. Time is something every grieving parent wishes they had more of when saying goodbye to their child. Katie and Phillip Hurlbut would have loved to have had more time with their daughter Ella Grace, who passed away seven weeks after birth due to complications from an infection in September 2015. 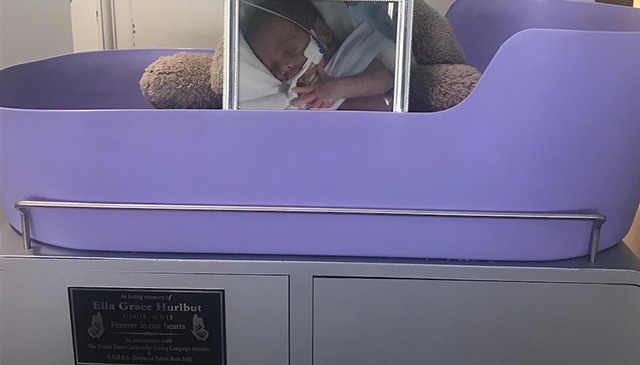 To extend the narrow window of time families have with a lost loved one, the Hurlbuts recently donated two Caring Cradles in Ella’s memory – one to the Women’s Specialty Unit at the Pavilion for Women and the other to Neonatal Intensive Care Unit at Texas Children’s Hospital The Woodlands. The cradles use a cooling blanket to cool the baby’s body, which prevents any distressing physical changes and lengthens the preservation of the child by 24 to 48 hours. The cradles can be positioned in a private setting so that families not only have more time with their baby but can say goodbye in a private, dignified way. Jenni Fair, patient care manager in the NICU at Texas Children’s Hospital Medical Center campus, said the cradles are especially helpful to mothers who might have been ill during delivery and unable to spend time with their child immediately after birth. The Hurlbut’s donation of the Caring Cradles came a little more than a year after the grand opening of the Butterfly Bereavement Room at the Pavilion for Women. Devoid of medical equipment, the Butterfly Room is a nicely decorated nursery where families can separate themselves from the hospital setting and mourn privately. When they leave the room, families can take a purple bag filled with things such as a bereavement gown for their baby, a blanket and a book. The Butterfly Bereavement Room also was an initiative spearheaded by the Hurlbuts. Five years ago, Priscilla Boos heard the worst news she could ever imagine – her husband had been given six months to a year to live. To deal with her feelings and to try and prepare for when her husband really was gone, Boos said she attended the Texas Children’s Employee Assistance Program’s Grief Recovery Group. The free 10-week program is dedicated to helping people find the support they need to move beyond grief, whether it’s over the loss of a loved one, a divorce or a situation at work. 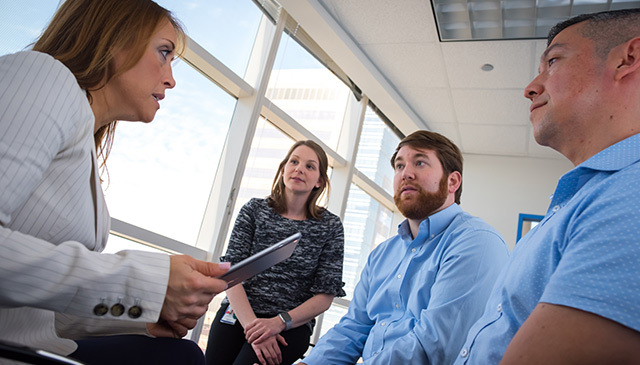 Facilitated by EAP staff and open to all Texas Children’s and Baylor employees, the program follows specific tasks outlined in The Grief Recovery Handbook by John James and Russel Friedman. Boos said the group made a huge difference in her life and that it made the journey toward her husband’s death much easier to bare. Most people don’t get the opportunity to complete unfinished conversations like Boos did because their loved is already gone or their loss has already occurred. Grief recovery helps people who are both anticipating a loss as well as suffering the effects of a loss that has already happened. In short, it helps people complete anything that was left unfinished at the time of a loss. “Successful completion of unfinished emotions allows us to become complete with the often painful reality that the physical relationship has ended,” James and Friedman said. To sign up for the next session of the Grief Recovery Group see below. Space is limited, so don’t delay. What do I need to know if I am interested in participating in the Grief Recovery Group? For the safety and success of all participants, commitment to and attendance at the 10-week program are essential. Thursday beginning January 22 and ending March 26. To register for the program go to the Learning Academy webpage, call Ext. 4-3327 or email eap@texaschildrens.org.